Don't you just love an old- fashioned bake like this banana bread? The original recipe was from Jen's blog A little bit of what you fancy, she kindly allowed me to transfer the recipe into grams and share her fabulous recipe with you. I tweaked it a little bit, but it is basically the same. 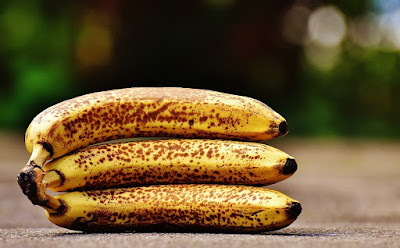 Needless to say, didn't have any ripe bananas, so I had to go out and buy some, which is just sod's law, but at last, I at last I was armed with the ingredients and ready to bake! The gorgeous smells from the banana bread wafted around the house and tempted Graham when he got home from work. I was just leaving for yoga, so I warned him not to touch the banana bread. I still needed to take some photos! How mean am I? That poor man had to wait two hours before I came home, but showed great strength of will and left it alone! I sliced a piece for him to try (after taking photos, of course). He really liked the strong banana taste, but reverted to type and slathered his second piece with butter! It's all gone now, sigh! You really have to make it! I insist! An old fashioned banana bread studded with chocolate chips and topped with cinnamon sugar. Preheat oven to 190c/170c fan/375f/gas mark 5. Mix together the topping ingredients and set aside. In a large bowl mash the bananas until gooey, whisk in the eggs, vanilla extract and sugar. Sieve the flour, cinnamon and baking powder in another bowl, then fold into the banana mix. Then gently fold in the chocolate chips. Pour into your tin and bake in the oven for 35 to 40 minutes. A skewer should come out clean, when you test it. When it comes out of the oven top with the cinnamon sugar and leave to cool in the pan for 10 minutes before removing from the tin and finishing the cooling on a rack. If you like this old fashioned bake try my treacle gingerbread. wow - some willpower to leave it on the side for 2 hours - a medal deserved! Hi Carolyn, I must have been a bit scary about it! Either that or he was just showing off! I can see why you had to try this one Holler. Both you and Graeme have great willpower! Not really Val, I was busy torturing every muscle in my body and Graham demolished the bread in two days! Hi Johanna, Taking photos st meal time is just met with a big sigh of resignation! It does smell lovely when it's baking, doesn't it? The night I made it, we went to sleep with the scent of freshly baked-banana bread still wafting around... Gorgeous. And Mr B is well used to me trying to snap pic while his dinner gets cold. Oh, the hazards of being married to a food blogger! Nice looking banana bread. Banana bread is one of my favorites. It smells amazing when it is baking and it and who could resist having a slice or three when it is still warm from the oven? It did smell gorgeous Jen, it was a good recipe! Hi Kevin, I fortunately was out while it cooled, so did not scoff it all, but had a reserved one slice later. Cake & loaves are way too tempting when they are just out of the oven! 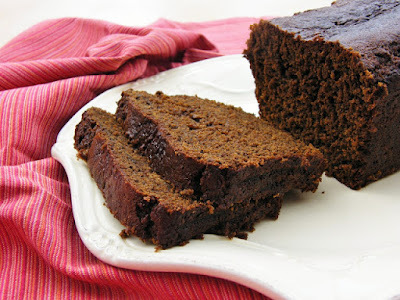 oooh, cinnamon and chocolate sound like such scrumptious additions to a banana-bread loaf! Chocolate and banannas - a match made in heaven! Then to add cinnamon sugar! How could you not touch it for 2 hours! And your plate is so pretty! Yum! I love butter on mine and also for something different, I like cream cheese that has been softened! Although, blasphemy to put butter on it! Hi Deb, the cream cheese idea is certainly something to think about! The plate, alas, I only have one like it! Hi Pia k, I think the butter thing, is Scottish, but you are right it didn't need it! Mmm this looks good. I feel guilty putting chocolate chips in banana bread because I have this idea in my head that banana bread is healthy. WOW this is a great combo of flavours and looks so delicious! Hi Ashley, You have to spoil yourself sometimes, but actually, it would taste just as good without the chocolate. The banana flavour is lovely! Hi Mary, that's great news! No it's ok, I don't mind! Hi Rosie, it is super tasty! oh my gosh. i am obviously too hungry to be looking at delicious recipes. that looks amazing! oh my word - that looks and sounds incredibly moreish. Wow! It's Snowing, it's Soup Time!